uuid : acfda03e-7dc0-4437-b60a-2ec19301ad60 templates_id: 119542 templates_uuid: "7dc7f940-806a-46d5-9ece-de226d4c2b6b" title: "Disciplinary Hearing Letter - Notice of Disciplinary Hearing " display_name: "Invitation letter to a disciplinary hearing for misconduct" meta_keywords: "Notice of disciplinary hearing and Employee misconduct hearing notification " description: "
Make sure you do things right when you discipline an employee, with this disciplinary hearing letter. This notice of disciplinary hearing sets out in clear and simple terms the process to be followed and the employee\302\222s rights, helping ensure that the employer complies with the laws on unfair dismissal. It covers the disciplinary allegations, witnesses at the hearing and witness statements, the right of the employee to bring a companion and potential sanctions. What is an invitation letter to a disciplinary hearing for misconduct? This letter sets out in clear and simple terms the process to be followed and the employee\'s rights. It covers the disciplinary allegations, witnesses at the hearing and witness statements, the right of the employee to bring a companion and potential sanctions. 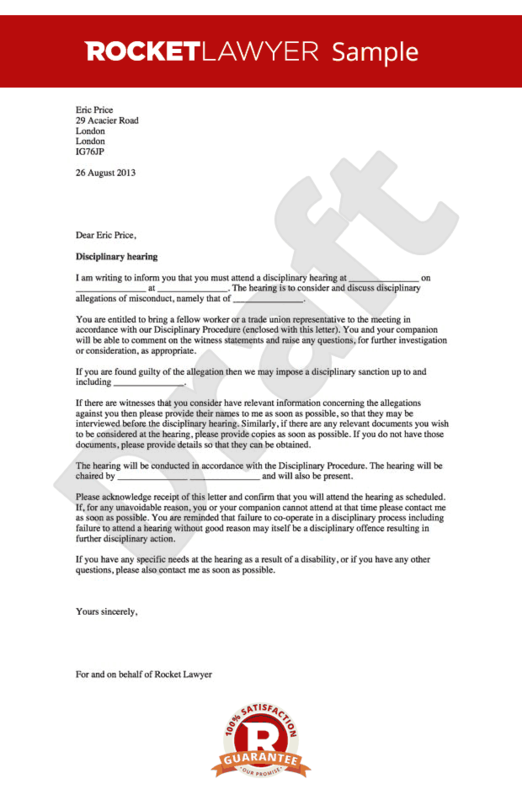 Why do you need a letter inviting an employee to a disciplinary hearing? If you are formally disciplining an employee for misconduct, this letter helps to ensure an employer complies with the laws on unfair dismissal. In particular it is designed to fulfil certain requirements of the statutory ACAS Code of Practice on Disciplinary and Grievance Procedures. Make sure that you include enough information about the allegations against the employee so they are able to fully understand what they are accused of. If the alleged behaviour breaches a specific rule in the employment contract or handbook, say this. The letter should also give details of the time and venue for the disciplinary meeting and advise the employee of their right to be accompanied at the meeting. Do I need to specify that dismissal is being considered? If dismissal is under consideration then this must be stated in advance in this letter or the dismissal may be considered automatically unfair. Employees can normally only be dismissed for a first offence if it is gross misconduct. How should the hearing be conducted? Before the hearing, ensure that all the correct arrangements are in place as set out in your business\302\222 grievance or disciplinary policy. The employer should set out the allegations in full and allow the employee a reasonable opportunity to present any evidence and defence. The employee must also be allowed to call witnesses. Read How to run a disciplinary hearing for further information. Who should run the meeting? A senior member of staff or manager will normally be the person who chairs the meeting and makes the decision about any disciplinary sanction. It should be someone who was not involved in the allegations unless this is impossible due to the size of your organisation. It is not essential that the person chairing the meeting be a more senior member but is recommended. What if the employee is unhappy with the outcome of the disciplinary hearing? The employee must be given a reasonable opportunity to appeal the decision. This would usually be set out in the business\302\222 grievance and disciplinary policy. The employee would need to appeal in writing and state their grounds for appealing. If you choose to accept an appeal by the employee you can respond with a letter inviting an employee to an appeal hearing for misconduct.
" created_timestamp: "2018-10-08 04:36:46.0" modified_timestamp: "2018-10-08 04:36:46.0" active: true created_by: 236 modified_by: 236 dcm_id: 232 url_slug: "Letter-inviting-an-employee-to-a-disciplinary-hearing" meta_description: "Create an employee disciplinary hearing letter with simple guidance from Rocket Lawyer. Make sure you do things right before a disciplinary hearing. Try this notice of disciplinary hearing for free with help from expert solicitors when you need it." time_to_complete: "10 minutes" role1: "Employer" role2: "Employee"
Make sure you do things right when you discipline an employee, with this disciplinary hearing letter. This notice of disciplinary hearing sets out in clear and simple terms the process to be followed and the employees rights, helping ensure that the employer complies with the laws on unfair dismissal. It covers the disciplinary allegations, witnesses at the hearing and witness statements, the right of the employee to bring a companion and potential sanctions. This letter sets out in clear and simple terms the process to be followed and the employee's rights. It covers the disciplinary allegations, witnesses at the hearing and witness statements, the right of the employee to bring a companion and potential sanctions. Before the hearing, ensure that all the correct arrangements are in place as set out in your business grievance or disciplinary policy. The employer should set out the allegations in full and allow the employee a reasonable opportunity to present any evidence and defence. The employee must also be allowed to call witnesses. Read How to run a disciplinary hearing for further information. The employee must be given a reasonable opportunity to appeal the decision. This would usually be set out in the business grievance and disciplinary policy. The employee would need to appeal in writing and state their grounds for appealing. If you choose to accept an appeal by the employee you can respond with a letter inviting an employee to an appeal hearing for misconduct. More than just a Invitation letter to a disciplinary hearing for misconduct template, our step-by-step interview and guidance makes it easy to create your document. Easily create online, download, print and sign your free Invitation letter to a disciplinary hearing for misconduct in minutes. This document is also sometimes called: Notice of disciplinary hearing and Employee misconduct hearing notification .